Even in this day and age of digital communication and social media, attending an exhibition can give great benefits and for many businesses is often the only way to carry out face-to-face marketing with their customers and prospects. When done well exhibitions can yield many more sales leads than any other type of marketing. Attending an exhibition is hard work and can be expensive in terms of both time and money but the rewards are very beneficial. If you are planning to exhibit at a trade show this year we offer a wide variety of display solutions, including portable displays. However, to really make your mark and stand out at your next event, why not consider a bespoke exhibition stand? This is an exhibition stand designed specifically for you to showcase your business to its best. Bespoke doesn’t necessarily mean expensive. We can work within your budget to provide a stand which will meet your requirements and more. We can offer you so many options for a bespoke exhibition stand, here are just a few ideas to give you inspiration. The most amazing exhibition stands can be created by using the humble pop up stand as its foundation. Linked pop up stands are pop ups which are skilfully connected to create any configuration and sized stand that you require. With clever graphic design, individual pop up stands are joined using linking graphic panels. 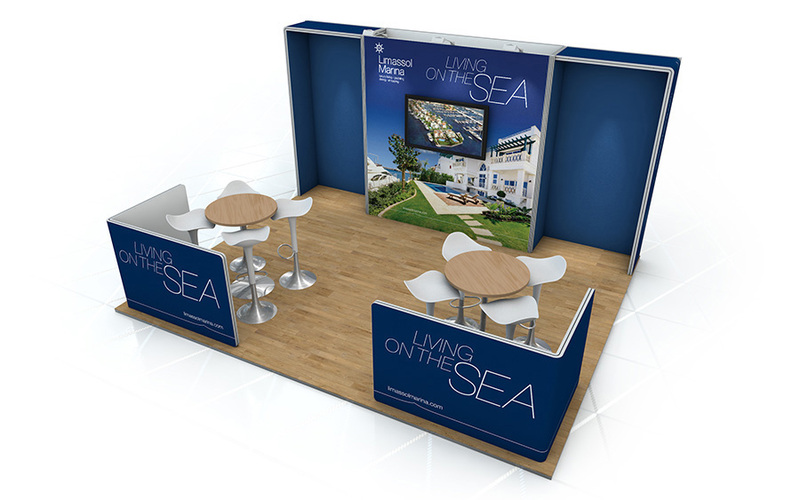 On the face of it, no one would know that your bespoke exhibition stand is simply linked pop up stands! The beauty of using pop up stands is that they are so easy to use – each frame simply pops up and the graphic panels are attached. This makes assembly and disassembly easy and quick. All components of each pop up stand will pack away into the wheeled cases provided making even the biggest linked pop up stand portable and easy to transport and store. 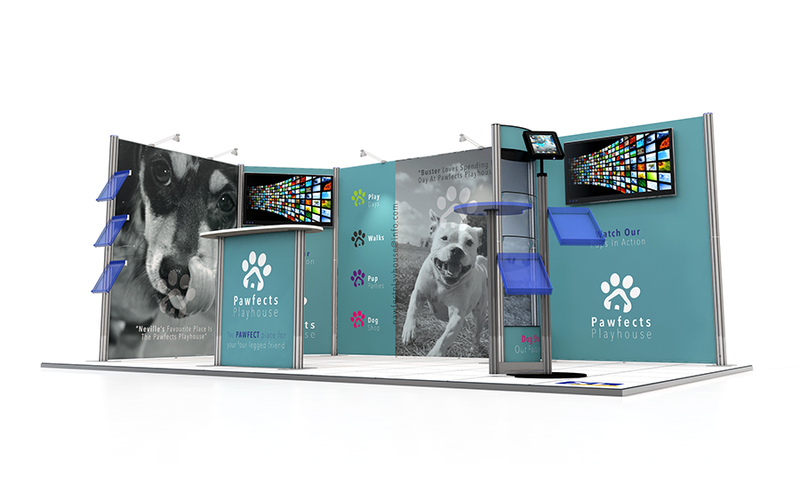 Add in other display stands and accessories, such as roller banners, fabric arches, hanging structures, seating options, promotional counters, literature stands and iPad displays, and you can create a truly unique, yet functional, exhibition stand. Centro is a modular display system which is flexible and versatile. Our range of Centro exhibition stands offers a variety of options for all stand shapes and sizes. Centro based on a unique RotrLink connection system whereby poles and rails simply twist and lock together and the rails attach easily to the poles to build the Centro frame. Graphic panels are then attached to the frame using magnetic tape. Easy to assemble and disassemble, Centro also comes with wheeled case for easy storage and transport. Using this foundation as a building block you can then join further Centro stands and accessories to create a bespoke exhibition stand which meets your needs perfectly. Accessories, such as display pods, lighting, promotional counters, shelving and AV stands, will create a stunning and professional display. As Centro is a modular system, all components are compatible with each other meaning the stand can be reconfigured for different uses or can be added to in the future to create a large stand when budget or marketing needs allow. 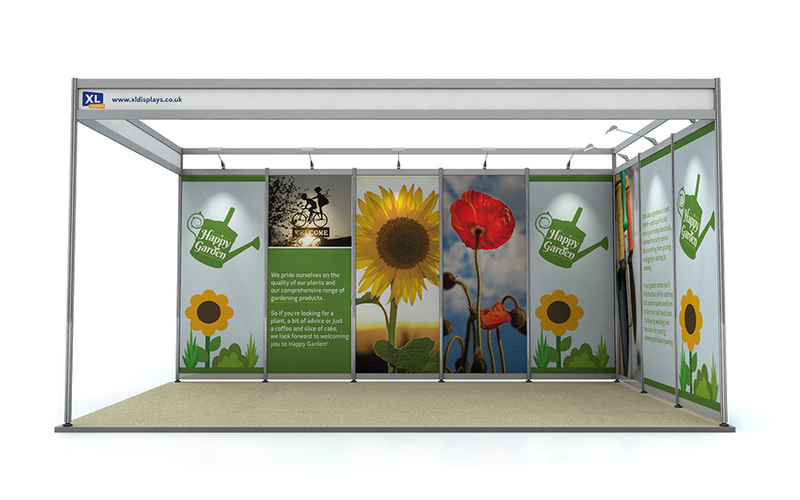 A cost-effective way of creating a bespoke exhibition stand is to purchase shell scheme graphics. As the ‘shell’ or hardware of your stand is provided by the venue you only need to pay for the graphic panels which attach directly to the shell scheme frame. Graphic panels are printed with your artwork or branding and will transform a plain shell scheme into a customised exhibition stand. We offer shell scheme graphics for a wide range of stand sizes and shapes – back wall, U-shape and L-shape. Choose from PVC graphics or Foamex graphics, both of which are printed in full colour to photo quality standard. Foamex is a lightweight, rigid foam board. PVC graphic panels are printed and then laminated for protection and durability. Panels can be rolled up without damage for easy storage and transportation. To make the most of your exhibition space, why not add accessories to your shell scheme stand to add the finishing touch? Display equipment, such as iPad stands, monitor stands, literature holders and promotional counters, will make your stand practical as well as give is a professional finish. Offering unmatched levels of customisation this range of custom built exhibition stands utilises Linear and Vector hardware display systems. Linear and Vector stands can be made to suit any exhibition stand space and configuration. The hardware consists of lightweight aluminium posts and rails which join together to create the frame. Graphics, printed with your artwork or branding, are then attached. Depending on the system used and design of the stand, graphics are printed onto fabric, PVC or Foamex. Due to the modular nature of this hardware, stands can be built with walls, a roof, archways and storage rooms, all with printed graphics to truly customise your stand. Add in a whole host of accessories, such as monitor stands, hanging displays, portable counters, seating options and lighting, and you will end up with an exceptional exhibition stand which will beat your competitors hands down. Why choose XL Displays for your bespoke exhibition stand? 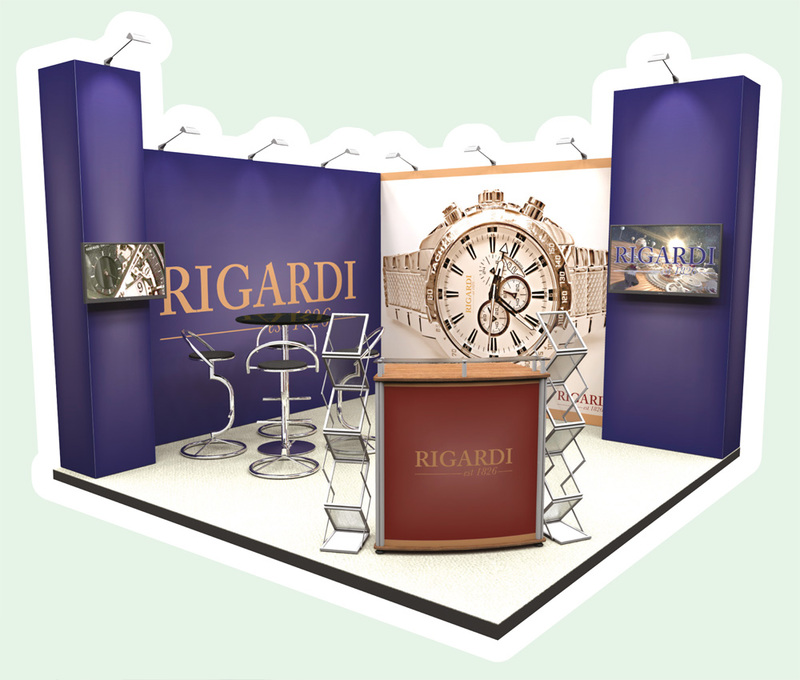 Expertise – we are experts in exhibition stand design with over 20 years’ experience in the industry. Our experienced sales team can provide advice and guidance on what will work best for your business. Award winning customer service – your exhibition stand project manager will work with you through every step of the process, from initial concept, design, manufacture, test build, installation and post event follow up. Graphic design – we offer a graphic design service and one of our talented designers, experts in large format design, can design the stand in line with your branding and requirements to create a stand which will ‘wow’ your customers. Artwork checks – if you provide your own artwork we will check it thoroughly before printing to ensure it will produce the best possible result. Quality assurance – we will test build the stand and you are welcome to attend the test build stage to see your stand for yourself. Every element of your exhibition stand will be checked before it is dispatched. We will not dispatch anything unless we it meets our very high standards. Installation – we can provide an installation service where our experts will transport and build your stand at your venue. They will also come along at the end of the exhibition to dismantle and pack away your stand for you to take away and store. Reconfigure your stand – we can design your stand so that it can be re-modelled for different stand sizes or shapes meaning your stand can evolve to meet changing business needs in the future. Customer reviews – our customers are our best advocates so please visit independent review site Trustpilot to see what they think of us. No obligation – all our advice, consultations and quotations are free and you are under no obligation. For more information on our bespoke exhibition stands and how we can help you with your next exhibition please contact us. You can also book a free consultation with an exhibition stand manager, just call us on 01733 511030.